Hi, all. In the interest of spreading the joy of calligraphy, I'll start posting periodic tips. Links will be mailed directly to members of the Inland Empire/Pomona Valley regional group of the Society for Calligraphy (southern California) and to my students. Anyone is welcome to follow this blog to receive notifications. 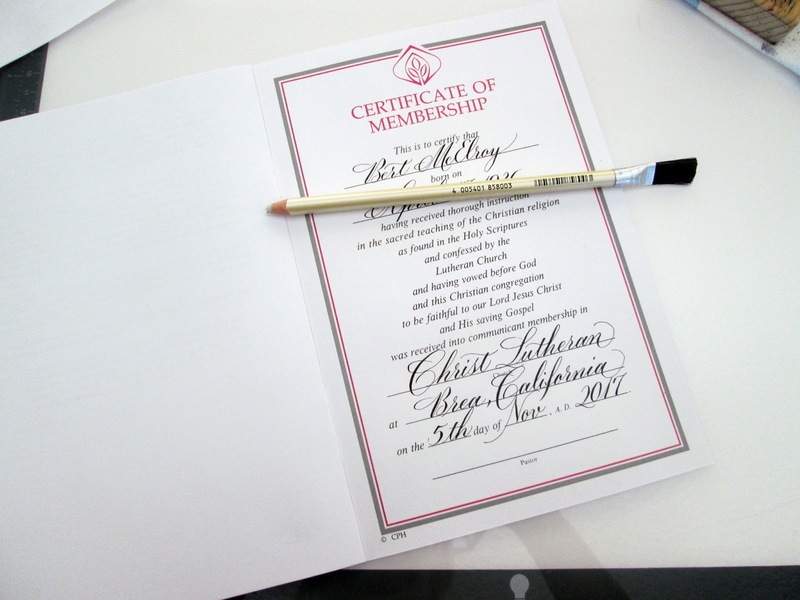 A couple years ago, I volunteered to fill in certificates for my mom's church. In the past, I had experienced writing on envelopes where the ink bled, but that was usually remedied by using sumi ink or gouache. 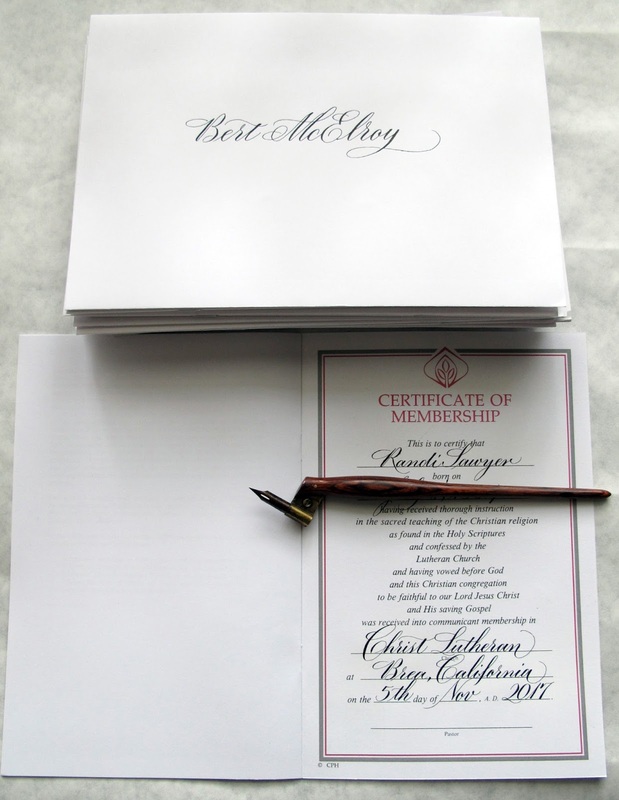 The paper used for these certificates and envelopes turned out to be the absolute worst! I lettered the first batch of certificates in italic. I tried various types of ink with a broad-edged dip pen--sumi, Higgins Eternal, dark walnut, gouache, among others--they all bled. I tried a Manuscript cartridge pen--I prefer dip pens, but these pens usually work on most papers--it also bled on this paper. Finally, I tried a calligraphy marker, which usually works on any paper--even that bled! I have developed various solutions, which I'll share below. 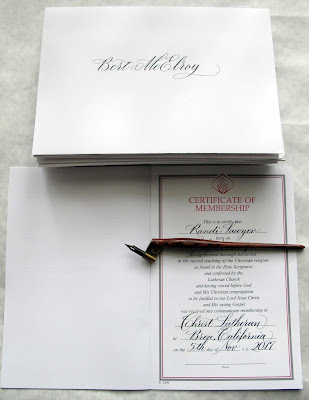 I spray the certificate pages with Krylon Workable Fixative. You don't want to do this inside--the fumes will make you sick! I lay them on newspaper outside, then spray a light coat. After allowing them to dry for at least 15 minutes, I give them another light coat, then let them dry for at least a couple hours. For the past several batches I have had good results with writing in English Roundhand (aka Copperplate), using McAffery's Penman's ink (purchased from John Neal Bookseller, or Paper and Ink Arts). Recently, I've used up my black Penman's ink and will reorder soon--it's a good one for pointed pen users to have on hand. Let it suffice to say that I am currently trying to reduce my stock of probably 50+ bottles of various inks. (Newbies, take my advice and don't accumulate so many--some go bad, but even if they don't, they take up too much space and you have to search for what you need! Just keep your favorites on hand and maybe one or two others you want to try). For this batch, I chose Chinese charcoal ink, similar to sumi. It was thick, so I dipped the pen lightly into water before dipping into the ink. This bled, despite the workable fixative! So, it was time to get out the powdered gum sandarac. This often comes conveniently packaged in a little cloth bundle, as shown in the photo. I took the bundle and lightly "pounded" it across the writing area--the light-colored particles were visible upon close inspection. Then I rubbed the bundle across the surface a few times, to work the particles into the fibers and ensure they were evenly distributed. I lightly blew to remove excess. That took care of the problem, as long as I wasn't too heavy-handed with the ink, which is the goal, anyway! If you have any questions about this post or other lettering topics, feel free to post a comment. I hope to never stop learning, so any suggested improvements in my procedures or posts are appreciated, too. Happy writing! One of the pieces that I drew several years ago, while in Liesbet Bouden's class at the Passionate Pen conference in Sonoma. It was just framed--I should have taken the photo before the work was covered with UV glass! Letters are drawn, gradually enlarged, refining at each step, then painted with gouache using a broad-edged nib.